Arthur Giles Blake was born in the North-East, educated at Slough Grammar School and was a graduate of the Royal Navy College. He served in the Fleet Air Arm and gained his 'wings' in January 1940. Five months later he was loaned to Royal Air Force. He shot down at least five German aircraft during the Battle of Britain. He was killed in October 1940 when his aircraft was shot down, crashing in New London Road, Chelmsford. He was credited with shooting down at least five German aircraft, including an He111 on 9th September 1940, a Bf109 and a share of an He111 on 15th September 1940 and two Bf109s on 17th September 1940. Arthur was killed on 29th October 1940 while still serving with 19 Squadron when his aircraft (number P7423 and markings QY-Y) was shot down by one or more German aircraft, and crashed at Oak Lodge in New London Road, Chelmsford at 5.12 pm. Sub Lieutenant Blake had taken off with eleven of his squadron at 4.15 pm to patrol over Kent. It was his third patrol of the day. Earlier the squadron had been airborne from 10.40 am to 12.10 pm and 1.30 pm and 3.15 pm to patrol on a line between Maidstone and Sheerness during which no enemy aircraft had been seen. During his final patrol comrades in 19 Squadron spotted seven Messerschmitt Bf 109 aircraft above them but they were unable to engage them. It is thought that one or more of the Bf 109’s, which had probably participated in an afternoon raid on North Weald Aerodrome, swept down and attacked his aircraft which was flying a search role alone behind the rest of 19 Squadron. They had attacked the most vulnerable aircraft. It is likely that Sub Lieutenant Blake was killed at his controls during the attack and before his stricken aircraft crashed because it was observed from Chelmsford to make several loops before a final plunge from a southerly direction into Oak Lodge, probably passing over Prince’s Road and Moulsham Street in its final moments. The Spitfire collided with the front north-east corner of Oak Lodge (then number 65 but given the number 216 in 1953). The property, which was occupied at the time by the 586 Army Field Company of the Royal Engineers, was badly damaged by the impact of the aircraft. The front corner of the property, including a box room, scullery, cellar, toilet, coal shed and garage was completely destroyed. The kitchen fireplace and stove were damaged as was the kitchen door and frame.Windows were broken, one chimney stack was severely cracked and one partially demolished. Most of the internal walls and ceilings were cracked. A wash basin and toilet were smashed. There were a few tiles off the roof and service pipes damaged. Damage was also inflicted on the staircase, hall doors and windows, and the wall between the scullery and hall was badly damaged. A small fire was started but that was soon extinguished. Outside, telephone wires and water mains were broken and the boundary wall with Fairleigh, the neighbouring house to the north, was partially destroyed. Fairleigh also suffered damage to slates and guttering of its sun room, three ceilings partially collapsed and one or two windows smashed. The first reports of the incident were made to the A.R.P. authorities three minutes after the crash with a report of a Spitfire crashing in flames in Chelmsford. Ten minutes later, at 5.25 pm the location was reported as near to The Cricketers pub in Moulsham Street). At 5.37 pm the exact location of Oak Lodge was reported and the fact that aircraft and house were on fire, with the fire brigade and police on the spot. At 5.50 pm, as dusk closed in, the next report stated that the aircraft fire was out and the pilot presumed dead. It also confirmed the closure of New London Road between Cherry Tree Corner (the junction with Writtle Road and Elm Road) and the Rising Sun pub. At 7.35 pm a final report stated that the remains of the pilot had been removed to St. John’s Hospital in Chelmsford and that New London Road had been re-opened. Sub Lieutenant Blake was subsequently buried at St. Mary’s Church in Langley near Slough., Berkshire (row 13, grave 3). Arthur's father died in 1942; his mother in 1968. Arthur was born in Northumberland in 1917, one of eight known children of John Henry Laws Blake and Mary Jane Blake (nee Carson). The couple had married in 1892. Arthur's siblings included: Edith Jane Blake (born in 1893), Nora Garson Blake (1894-1983), Lydia May Blake (1897-1976), Doris Elizabeth Blake (1904-2005), John Henry Laws Blake (1907-1979) and Margaret Olga Blake (1909-1979). Arthur’s father was at one time a commercial traveller for an asbestos company. 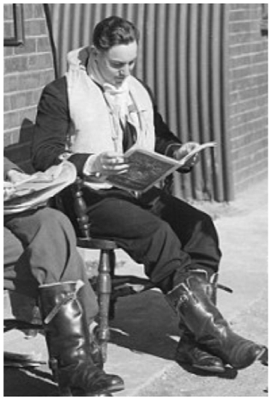 Arthur was educated at Slough Grammar School and went to the Royal Navy College. He joined the Fleet Air Arms and qualified as a pilot in January 1940. Arthur served as a Sub Lieutenant (Pilot) with the Fleet Air Arm, Royal Navy. In June 1940 Arthur was serving at H.M.S. Daedalus in Hampshire when he was transferred from the Royal Navy to the Royal Air Force, one of 58 naval pilots loaned to the R.A.F. during the Batte of Britain. He was initially posted to 7 Operational Training Unit to learn how to fly the Spitfire and subsequently was drafted to 19 Squadron, first at Duxford, Cambridgeshire, where he was given the nickname ‘Admiral’. Later he served from Duxford’s satellite airfield at Fowlmere, Cambridgeshire.